Well, according to the blisters on my feet it wasn't easy but I completed the Ridgeway 40 (as mentioned in previous posts). I needed a good (and fit) friend to keep the tempo high to take my mind of the blisters but we made it inside of our target 12 hours. 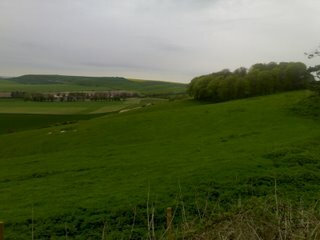 I could have included rather gory pictures of my feet, but decided it was more tasteful to show this vista north of Marlborough (one of the few photos taken whilst I was still enjoying the landscape and before serious focus was required). The Ridgeway 40 follows an ancient route from Overton Down in Wiltshire to Streatley in Berkshire and this annual event is a celebration of that history.